On the 14th June 2017, a fire engulfed a tower block in West London, seventy-two people lost their lives and hundreds of others were left displaced and traumatised. The Grenfell Tower fire is the epicentre of a long history of violence enacted by government and corporations. On its second anniversary activists, artists and academics come together to respond, remember and recover the disaster. The Grenfell Tower fire illustrates Britain's symbolic order; the continued logic of colonialism, the disposability of working class lives, the marketisation of social provision and global austerity politics, and the negligence and malfeasance of multinational contractors. 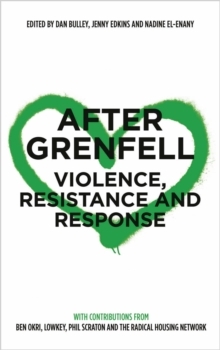 Exploring these topics and more, the contributors construct critical analysis from legal, cultural, media, community and government responses to the fire, asking whether, without remedy for multifaceted power and violence, we will ever really be 'after' Grenfell? With poetry by Ben Okri and Tony Walsh, and photographs by Parveen Ali, Sam Boal and Yolanthe Fawehinmi. With contributions from Phil Scraton, Daniel Renwick, Nadine El-Enany, Sarah Keenan, Gracie Mae Bradley and The Radical Housing Network.